LUKE: “ARE LEG LOCKS BETTER?”; YODA: “NO, NO, NO. QUICKER, EASIER, MORE SEDUCTIVE.”; LUKE: “BUT I LEARNED THEM FROM WATCHING YOUTUBE VIDEOS! 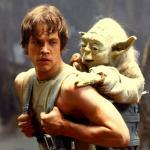 TELL ME WHY I CAN’T…"; YODA: “BECAUSE YOU'RE STILL A WHITE BELT WHO CAN'T EVEN BREAK MY GUARD!"